Nope, Freemasonry isn’t a religion. It’s unlikely, also, that you’re actually ‘reading’ Morals and Dogma; most people who pull out these quotes as definitive ‘proof’ or a ‘fact’ generally got them out of context from some website that got them from somewhere else. Since your link is to a specific webpage – and not the whole book – and the only other things on that webpage are links to other specific pages of Morals and Dogma, it’s far MORE likely that you’re just another one of those whack jobs who cherry pick nonsense and attempt to make it something that it’s not. The passage you quote is indeed out of context, but that’s irrelevant. What IS relevant is the lack of reading and comprehension skills you’re demonstrating. The quote itself demonstrates that Freemasonry ISN’T a religion. It quite clearly says that a Masonic Lodge is a Temple OF religion, and that the teachings are instructions IN religion. It certainly doesn’t say that Freemasonry IS a religion. Why doesn’t Pike say that it is? Because Freemasonry isn’t a religion; it’s a fraternity. Albert Pike was indeed a Freemason. And a General for the South in the Civil War. And an attorney. And the guy who organized the Scottish Rite, Southern Jurisdiction. Albert Pike wasn’t an ‘authoritative figure within Freemasonry.’ He was an authoritative figure in many things … but not really in Freemasonry. The closest he came to being ‘authoritative’ was in the Scottish Rite – which ISN’T Freemasonry; the Scottish Rite is an appendant body and has nothing to do with Freemasonry. Albert Pike wasn’t a “33 degree Scottish Rite Worshipful Grand Master.” Albert Pike was a 33rd Degree Scottish Rite Mason. Albert Pike was Master of Magnolia Lodge No. 60. When the Royal Order of Scotland was instituted in the United States, Albert Pike was named the Provincial Grand Master, ad vitam (“for life”). After reworking the Scottish Rite degrees, Pike was eventually elected Grand Commander of The Supreme Council, Scottish Rite, Southern Jurisdiction. 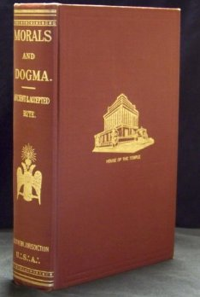 There’s no such thing as a “33 degree Scottish Rite Worshipful Grand Master.” If you got Pike’s title wrong AND you didn’t read Morals and Dogma AND you took a quote out of context AND you misinterpreted the quote, well … then it’s far more than reasonable to conclude that you don’t know what you’re talking about, and your argument will fail because you have an untenable position. That’ll happen when you cherry pick someone else’s cherry picked cherry pickings and don’t bother to research what it is you’re supposedly arguing about. Morals and Dogma is a book. It was written by Albert Pike. It was specific to the Scottish Rite. Unfortunately for your silly argument, it’s not a book related to Freemasonry; it’s related to the Scottish Rite (it even says so in the title). Even MORE unfortunate (for you) is that the book isn’t used by the Scottish Rite with any regularity anymore. The book used most often nowadays by the Scottish Rite Southern Jurisdiction is “A Bridge To Light” by Rex Hutchins. You’re trying to paint Freemasonry as a religion by referencing a deprecated text for a body that isn’t Freemasonry. You might as well have used the Breakfast Menu from McDonald’s as a basis for your argument; it’d have the same impact and relevance. Your argument fails on virtually every level. You couldn’t understand even the simplest of sentences – written in plain english – and drew a conclusion that just isn’t based on facts or reality; it’s based on fantasy. If you have any additional questions, please feel free to ask (might want to do some actual research FIRST next time, though). As a 32 degree Mason, York Rite Templar, Shrine Noble, and member of a Masonic Lodge, I can state with all certainty, Masonry IS NOT, NOR HAS EVER BEEN a religion. Many are confused because we believe in a Supreme Being, and take an oath at the alter of Freemasonry, but we adhere to nor acknowledge belief in any one religion. All Masons believe in God, but we allow each member to follow his own faith.